when in reality it doesn’t take much more than 30-40 minutes, start to finish. 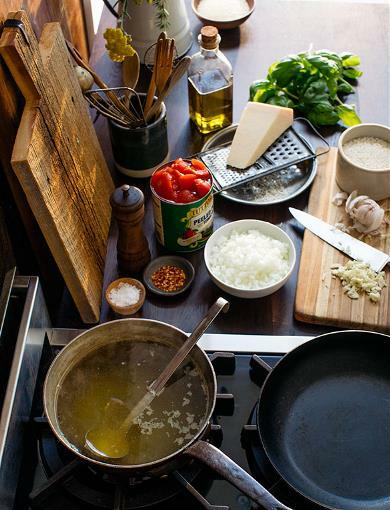 Click the thumbnails for a step-by-step guide to making risotto with success. 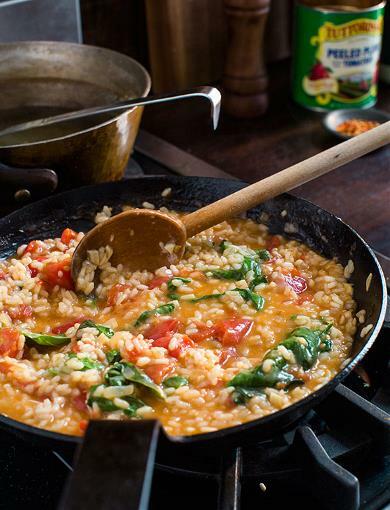 Because risotto takes a bit of attention, it is important to have everything ready before you start. 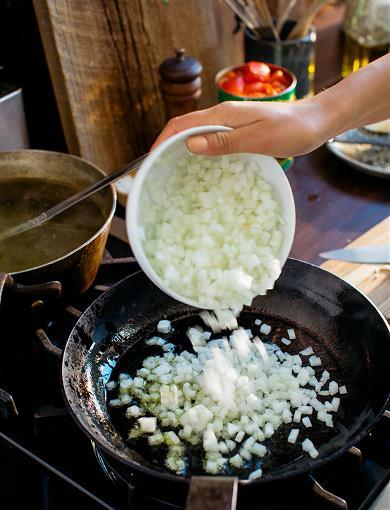 Start by heating some extra virgin olive oil in a pan then sweat onion and garlic until translucent and tender. Add rice to the pan and stir to evenly coat the kernels and sauté for about a minute. Now you’re ready to start adding the liquid. 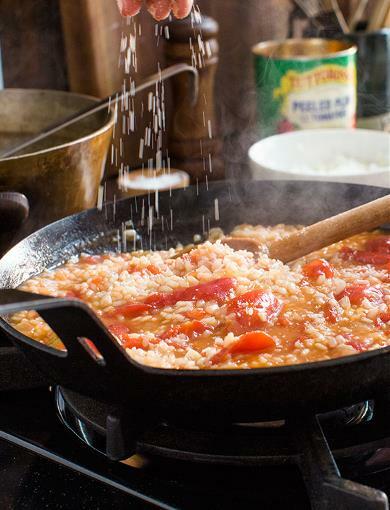 Risotto is made with Italian-grown Aborio rice. 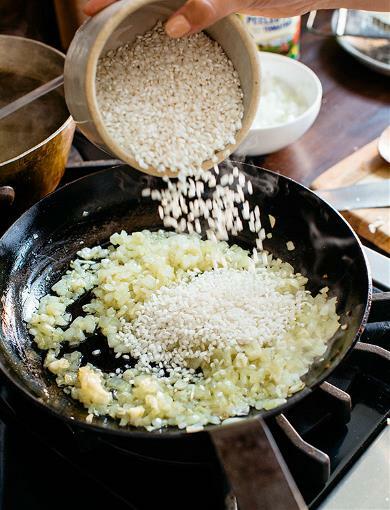 These rice kernels are short and fat compared to other short-grained rice and contain a large amount of starch giving risotto its creamy texture. Slowly add the stock, about ¼ cup at a time, allowing it to absorb before adding more. You will need to stir just enough so the rice doesn’t stick to the pan and burn. If you add all of the stock at once, you will only boil the rice and not allow for the starches to release. Unlike what you may have read, you don’t need to constantly stir the rice as this will cool it down and become sticky – not creamy, give your arms a break and stir occasionally. Add the tomatoes and continue to cook until the rice is just tender. Like pasta, it should have a bit of a chew. 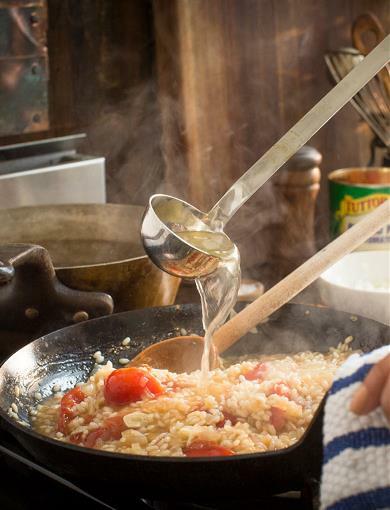 When the rice is ready, you should be able to pull a spatula through the risotto and it will slowly flow to fill the empty space. As a final step, add fresh grated Parmesan cheese, taste and add salt and pepper as needed. 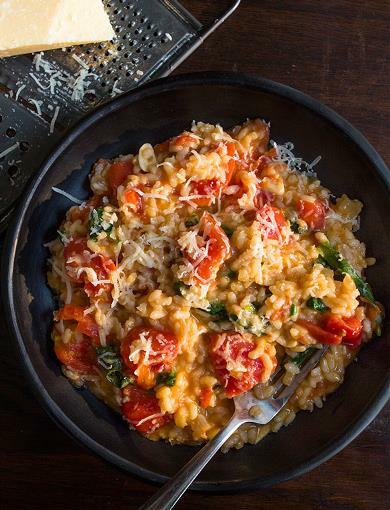 Serve immediately Risotto that sits will lose its creaminess, which is what makes risotto like a warm, creamy hug of comfort.